Formed 304 stainless steel. 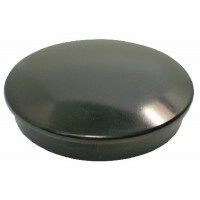 Plastic cap. A: 12"B: 3/4"C: 3-1/2"D: Description: 5 Spokes..
1/2-20 nut only f/2848 & 2853 Dia. : 1/2"-20 Replacement Nut..
12 mm nut f2848/2853 Dia. 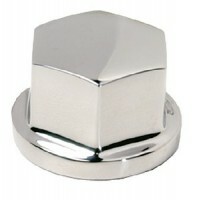 : 12mm Replacement Nut..
Ss wheel 13 1/2 w/turn knob Dia. : 13-1/2".. 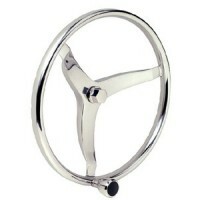 Steering wheel w/knob s/s 15 1 Dia. : 15-1/2"..
5/8-18 nut only f/2848 & 2853 Dia. : 5/8"-18 Replacement Nut..
Blk plas cntr cap (2855 2858) Description: Black Plastic Cap for 28551/28581/28541..
Flat spoke steering wheel 15in Dia. : 15".. Easily converts existing destroyer wheels to the most modern versions. 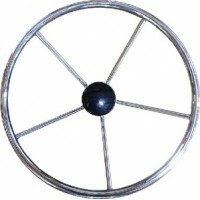 Attractive and durable black ..
S/s destroyer steering wheel w Description: Stainless Steel with permanent foam grip & black center ..
Ss destroyer steering wheel Description: Stainless Steel with genuine teak cap..
S/s destroyer steering wheel Description: Stainless Steel with turning knob & black center cap..
Deluxe sport style wheel - 14 Dia. 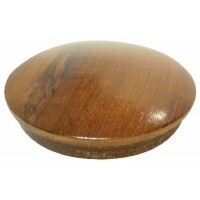 : 13-1/2"..
Teak center cap(for 2855 2858 Description: Teak Center Cap for 28551/28581.. 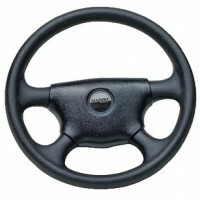 Steering wheel black ace Dia. : 13"..
Champion sp. wheel (bulk) Dia. : 13"..
Wheel- stealth 14 Dia. : 14 "..
Stealth wheel (hard pvc/ctr Dia. : 14"..
Wheel viper 14' ergonomic grip Dia. : 14"..
15.5in 25 degree ss steering Dia. : 15.5"Grip: Stainless Steel.. 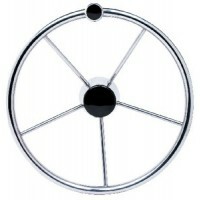 Steering wheel-black 3-spoke Dia. : 13.8"Rim: BlackSpokes: Black.. 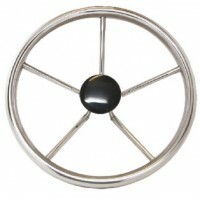 Steering wheel-black 4-spoke Dia. : 13.4".. Steering whl-blue-black grips Dia. : 13.8"Grip: BlackRim: BlueSpokes: Silver.. Steering whl-burl-black gripsp Dia. : 13.8"Grip: BlackRim: Burl WoodSpokes: Black.. 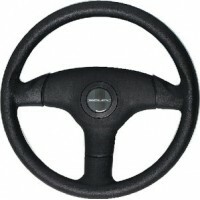 Steering wheel blk pvc grip Dia. : 13.5"Rim: BlackSpokes: Black.. 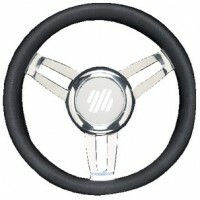 Steering wheel wht pvc grip Dia. : 13.5"Rim: WhiteSpokes: Silver.. Steering wheel blk red silver Dia. : 13.8"Grip: PolyurethaneColor: Black/Red/Silver.. 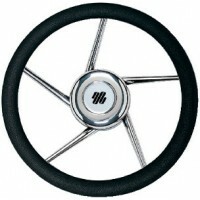 Steering wheel blk silver Dia. : 13.8"Grip: PolyurethaneColor: Black/Silver.. Steering whl blk vinyl chrom Dia. : 13.8"Grip: Vinyl w/ chrome hubColor: Black.. Steering whl wht vinyl chrom Dia. : 13.8"Grip: Vinyl w/ chrome hubColor: White.. 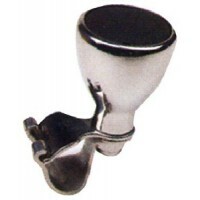 Steering whl-burl-black-silver Dia. : 13.8"Rim: Burl WoodSpokes: Silver.. Steering wheel silver silver Dia. : 13.8"Grip: SilverColor: Silver.. 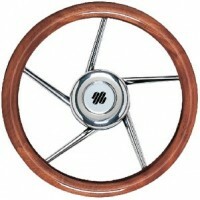 Steering whl-mahogany ss spks Dia. : 13.8"Grip: Mahogany.. 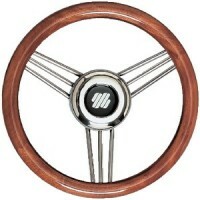 Steering wheel-mahogany 4-spk Dia. : 14.1"Grip: Mahogany.. 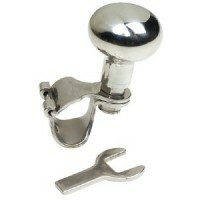 Steering whl blk poly chrome Dia. : 13.8"Grip: Polyurethane w/ chrome hubColor: Black.. 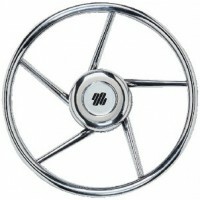 Steering whl wht poly chrome Dia. : 13.8"Grip: Polyurethane w/ painted hubColor: White.. Steering whl-pol silvr blk grp Dia. : 13.8"Rim: BlackSpokes: Polished Aluminum.. 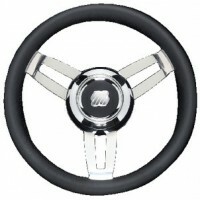 Steering wheel silver blk grip Dia. : 13.8"Rim: BlackSpokes: Silver.. 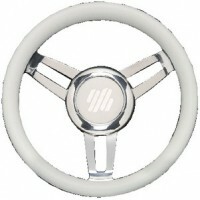 Steering whl-slvr-slvr 3-sp eq Dia. : 13.8"Rim: SilverSpokes: Silver.. Steering whl-purple-blk grips Dia. : 13.8"Grip: BlackRim: PurpleSpokes: Silver.. Steering wheel-red-black grips Dia. : 13.8"Grip: BlackRim: RedSpokes: Silver.. Steering whl-silver-blk grips Dia. : 13.8"Grip: BlackRim: SilverSpokes: Silver.. Steering wheel hub splined Dia. : Steering Wheel Hub - SplinedGrip: Steering Wheel Hub - SplinedRim:.. 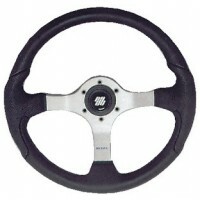 Steering whl ss grip ss 5 spk Dia. : 13.8"Grip: Stainless Steel.. 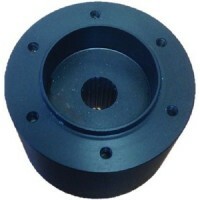 Steering whl-blk grip ss 5-spk Dia. : 13.8"Grip: Polyurethane.. 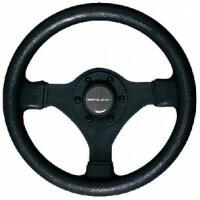 Steering whl-black poly 5-spk Dia. : 13.8"Grip: Polyurethane Firm.. 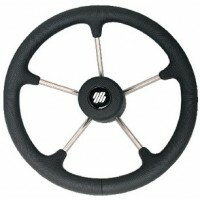 Steering whl-mah grip ss 5-spk Dia. : 13.8"Grip: Mahogany.. 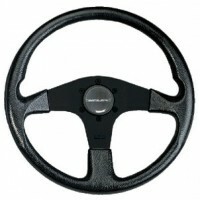 Steering whl-blk 3-sp softgrip Dia. : 11"Color: Black.. Steering whl-yellow-blk grips Dia. : 13.8"Grip: BlackRim: YellowSpokes: Silver..
Vetus, 15 In. 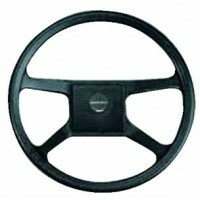 Steering Wheel With Black Foam Skin, KS38Z..
Vetus, 15 In. 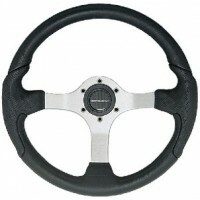 Steering Wheel With Gray Foam Skin, KS38G..
Vetus, 15 In. Steering Wheel With Mahogany Rim, KW38..
Vetus, 16 17/32 In. 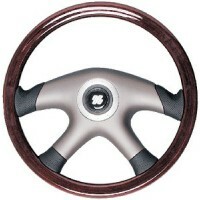 Laminated Mahogany Steering Wheel, KC42..
Vetus, 17 3/4 In. Steering Wheel With Gray Foam Skin, KS45Z..
Vetus, 21 1/8In. 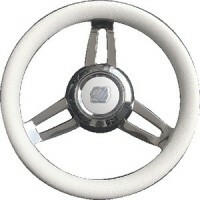 Power Boat Steering Wheel Grey, KS55G..
Vetus, 21 5/8 In. 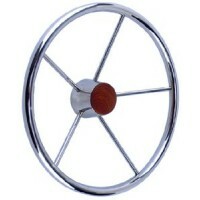 Steering Wheel With Mahogany Rim, KW55..
Vetus, 21 In. 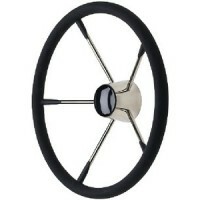 Steering Wheel With Gray Foam Skin, KS55Z..
Vetus, 22 1/2 In. Laminated Mahogany Steering Wheel, KC52..